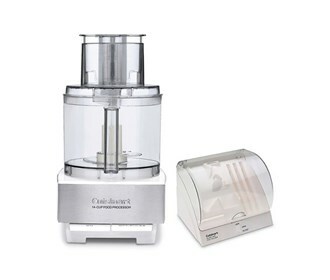 The Cuisinart DFP-14BCWNY/CSNRT-BDH-2 is a combination of 14 Cup Food Processor and Mini-Prep Plus Processor Kit. The Cuisinart DFP-14BCWNY is made from sleek brushed stainless steel, this sleek kitchen workhorse is a breeze to use and will whir through prep and cooking with ease. Whether you are making a weeknight meal or a weekend celebration, the large capacity work bowl will hold everything as the 720watt motor makes quick work chopping whole fruits and vegetables, shredding cheese, or kneading dough. 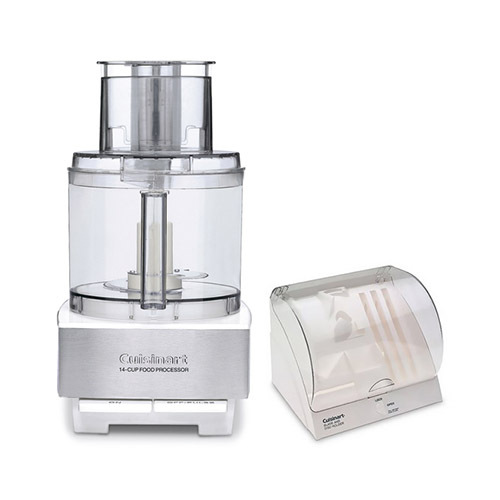 The Cuisinart BDH-2 is a simple unit that provides safe, convenient, and attractive countertop storage for three cuisinart blades and three cutting disks. The effective tamper-resistant locking device must be pulled out and twisted 90 degrees to access the cutting tools, and it automatically relocks when the lid is closed. The 14 Cup Food Processor & Blade & Disc Holder Kit has many exciting features for users of all types. You can extend the lifetime of your 14 Cup Food Processor & Blade & Disc Holder Kit with the purchase of a FactoryOutletStore Factory Protection Plan. See the 14 Cup Food Processor & Blade & Disc Holder Kit gallery images above for more product views. The 14 Cup Food Processor & Blade & Disc Holder Kit is sold as a Brand New Unopened Item.